Key Benefits : By the end of the course, students will be able to Plan IP Addressing, Install and configure Cisco Router in an Internet work secure Network by access-list and Manage Virtual LAN & WAN etc. If you are planning to appear for a CCNA certificationexamination, this information might be very helpful to you. The curriculum of this certification comprises of wireless network understanding and terminology, mitigation of security threats for starters, and improvement of skills in these areas. Boot Camp CCNA ........ 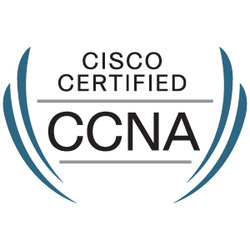 The CCNA (Cisco Certified Network Associate) certification, is an initial-level certification from Cisco that serves as a foundation for other Cisco certifications such as CCNP and CCNP Voice. CCNA-certified professionals can install, configure and operate LAN and WAN services, and they are informed in the use of various protocols and related aspects: IP, PPP, HDLC, Frame Relay, virtualization protocols, access list configuration, etc. Prerequisites for the CCNA 640-802 preparation course:Candidates should have a sound understanding of networks and related services, and internetworking needs; they must be very familiar with the TCP/IP protocol suite, subnetting and other aspects of IP configuration, and various network protocols. Network Layer, Datalink Layer, Physical Layer . Transport Layer Protocols (TCP, UDP). Internet Layer Protocols (IP, ICMP, ARP). Determining Broadcast & Network Address. Starting up with a Router and Switch. Booting a Router and setup mode. Passwords and Line Console Commands. Verifying & Debugging the Configuration. Configuring a Router and Switch. Verifying Configuration and Duplex Settings. Backing up and restoring startup configuration and IOS. Booting IOS from TFTP Server. Managing static and Dynamic Routes. Configuring Dynamic IP routing using RIP, IGRP. Managing and configuring OSPF & EIGRP. Avoiding Routing loops using split horizon, route poisoning. ISL Routing and Frame tagging. Wildcard Cards Implementing an Access List. Securing a Network Site with Access list. WAN Connection Types ISDN, X.25, Leased line and Frame-Relay. Cisco Certified Network Associate Voice (CCNA Voice) validates associate-level knowledge and skills required to administrate a voice network. The Cisco CCNA Voice certification confirms that the required skill set for specialized job roles in voice technologies such as voice technologies administrator, voice engineer, and voice manager. It validates skills in VoIP technologies such as IP PBX, IP telephony, handset, call control, and voicemail solutions. The 640-460 IIUC Implementing Cisco IOS Unified Communications exam is associated with the CCNA Voice certification. This exam confirms basic IP telephony installation, configuration, and maintenance skills by testing a candidate’s knowledge of implementing and configuring small- to medium sized IP Telephony solutions using Cisco Unified Communications Manager Express, Cisco Unity Express, and the UC500 Smart Business Communications System solutions. The following topics are general guidelines for the content likely to be included on the Implementing Cisco IOS Unified Communications exam. However, other related topics may also appear on any specific delivery of the exam. In order to better reflect the contents of the exam and for clarity purposes, the guidelines below may change at any time without notice. Certification Exam CenterWelcome to the CertificationKits CCNA Security Certification Center. Here you will find tons of resources to help you pass your CCNA Security 640-554 exam. You can literally spend days, here and it is all FREE for you to enjoy and to assist you in preparing and passing your CCNA Security exam on your way to more opportunity and a better job. We highly suggest that you have a full blown CCNA Security Study Guide and a CCNA Security home lab with the right routers, switches and newly required ASA device in it at your disposal so you can really learn the concepts to not only pass your CCNA Security exam, but also have the knowledge to do the job in the real world. No paper CCNA Security individuals here! So below you will find links for our article on how to build a CCNA Security Lab in a cost effective manner. The next item you will find in our CCNA Security 640-554 Certification Center is a compiled list of over 50 CCNA Security Theory Articles and within the articles you will find CCNA Security Labs covering many common CCNA Security topics on the Security exam. These are roughly five page articles and labs on a particular subject that are a great review to get you up to speed for your CCNA Security exam. About half of the articles have labs in them, so look toward the end of the article for the associated lab. We know that you need a little break when you are studying for your CCNA Security certification test and playing a game or two is an excellent way to break the monotony. So we have created CCNA Security games just for you! Let yourself break away from the grind for a bit in a fun way to learn which is totally painless. So if you significant other comes in and sees you playing these games, you can show them that you are really learning as you ace CCNA Security Jeopardy!